As I begin this module, my experience with data journalism is extremely basic. I’ve often used data within reports to find interesting facts and stories, but I’ve yet to delve much deeper into the possibilities than that. I did attempt to be proactive over the summer and tried something a little more complex. I spent eight weeks employed at my local paper, the Maidenhead Advertiser, and on my own initiative I began a small data project. 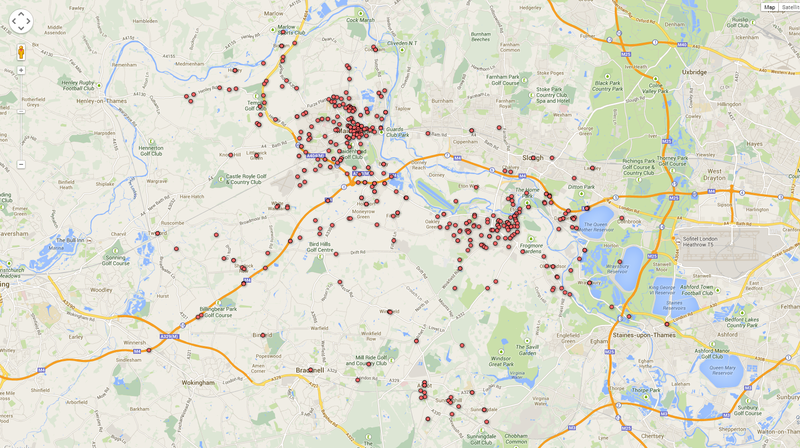 My idea was to use an FOI to get Thames Valley Police data on road accidents across Windsor and Maidenhead, and then to find a way to map this and find the most dangerous roads in the area. I asked for all accidents from the past three years, broken down to show the time and date it was reported, the road it happened on, how severe the injuries were and the types of vehicles involved. When I (finally) received the data though, it all came in horrendous PDFs, with vehicle types coded by numbers and the road information format very confusing and often inconsistent. 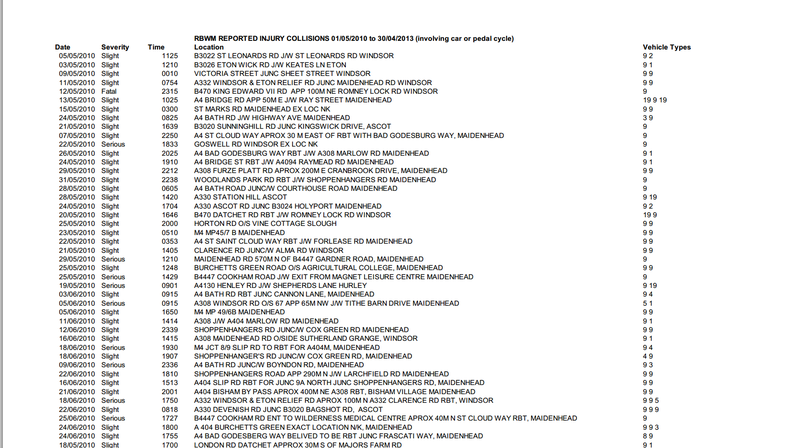 A screenshot from the PDF format the data Thames Valley Police used to send me the data. I spent a long time working out how to even get this data into an Excel file, then spent an enormous amount of time individually changing each entry’s time and vehicle information to make it usable. The lesson here, of course, is that my Excel skills need work, as I’m sure there must have been an easier way. I finally got to a point where I felt ready to upload my spreadsheet to Google and get it to appear on a map. I used Google Fusion Tables but, of course, it was unable to make sense of the location information, so I ended up manually adding geocodes to each entry individually. My time at the Advertiser had long since passed by this point, and finding and adding each geocode individually proved so time consuming that I’ve yet to finish. The map as it is can be found here. Please keep in mind that most of the points are not mapped correctly, so do not use it as if it were accurate. I’m sure that there are many techniques I could, and should, have used along the way to make this a far less painful experience. By the end of the year I’d love to be able to look back at this and say exactly what I should have done.